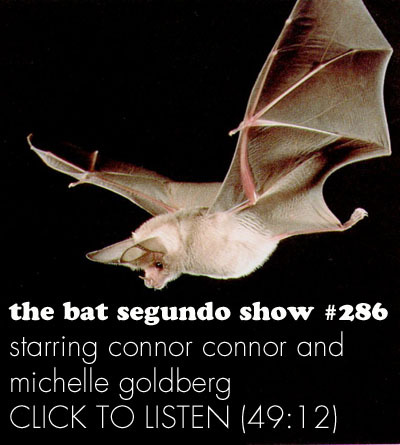 Michelle Goldberg appeared on The Bat Segundo Show #286. 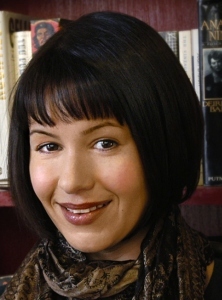 Michelle Goldberg is most recently the author of The Means of Reproduction. Condition of Mr. Segundo: Wondering if there’s any fate in what we make. Correspondent: You use the words — the modifier “seemingly liberated’ — to describe this educated Indian woman who goes and, of her own volition, says, “I want to have boys. I don’t want to have girls.” Let’s actually take this into consideration, along with the case of Fuambai Ahmadu, who would feel very much insulted by the notion that she is not empowered. Here is someone who has been circumcized and who finds the notion of being mutilated — that particular verb as applied to her — very gravely offensive. So now we’re dealing with a scenario in which, if we are trying to talk about broader problems like reproduction and reproduction rights, we are also talking about having to deal with people who have values that are 180 from us. And simultaneously we’re trying to get through to them. But now we’re in a situation in which we have to find some kind of Venn diagram of how we talk with them. And if you think that this is not reconcilable, as you suggested two answers ago, I must point out some problems with this overall thesis. Because if we cannot communicate to these people; if we cannot respect the rights in a cultural relativist way of these people to make decisions that are converse to pro-choice, that are converse to women’s right (at least as they are established in our country), how then do we find common ground here? Goldberg: Well, I’m not saying that we can’t discuss them. I’m saying that I don’t think it’s always — or maybe it’s just beyond me — to create some kind of absolutist system in which we can kind of hallucinate and create a hierarchy of what falls under the category of universal human rights, what is multiculturalism, and how we value the right of people to perpetuate their own cultural practices vs. the rights of dissidents to be protected by universal human rights guarantees. I clearly, over and over again, tend to side with people who say — with minorities who do demand to be protected by the same kind of universal human rights guarantees that I cherish. I’m not particularly sympathetic to multiculturalist or relativistic arguments, as opposed to universal kind of enlightenment type arguments. But I guess what I’m saying is that this book is about — I’m often interested in the ambiguities and the hard questions and the human stories in which it’s not as easy to sort out this hierarchy of values. You know, I’m not a philosopher like Martha Nussbaum, who has created this very rigorous and well thought out taxonomy of these different issues. Goldberg: Well, let’s back up and explain what we’re talking about here, right? We’re talking about the context of Agnes Pareyio. Goldberg: And Fuambai Ahmadu. We’re talking about female genital cutting, or female circumcision. Fuamabi Ahmadu is a woman in this book who is from Sierra Leone, who undergoes circumcision as an adult, who is someone who talks about it being a valuable part of her cultural identity, who is probably the most eloquent defender of the practice on the global stage. In part because, although it’s clearly very valued in these societies — otherwise, people wouldn’t fight so hard to keep the practices alive — the people who genuinely practice it aren’t people who have a lot of access to NGOs and the media, etcetera. So I think she’s an important voice. At the same time, I think the question of whether Eve Ensler is being imperialistic by supporting these women in Kenya who are fighting female genital cutting, I don’t know. To me, it’s not that interesting. And I think if you brought that up with Agnes Pareyio, who is someone who’s from the community who practices this, who’s underwent it herself, who’s regretted it her whole life, who’s a grassroots activist against it. Girls were running away from home to escape this practice and she was finding them places to stay and enrolling them in school. And then she finally met Eve Ensler. And then Eve Ensler started to support her. I think that the question of “Well, is it imperialist to support Agnes Pareyio?” is kind of insulting to her. Because she has just as much right. She’s just as authentic a voice for her community. She has just as much right to try to change and create progress in her community as we have to create progress in ours. Thanks for this interview! Brilliant writer, brilliant book.